You are curious and inquisitive in the third house, and Pluto makes you research something before you accept it as truth. Intelligent and perceptive, you know that when something doesn’t seem right it usually isn’t. Your desire for knowledge and helping to educate people drives your every thought and deed. Pluto symbolizes rebirth, power, control, obsession healing and major changes. The third house is constantly going through changes as your perception of the world and the information in it changes. You embrace the differences in people and places and are eager to learn all about them. Then once you have the basics down you want to spread that information to anyone who will listen (and even some who don’t want to listen!). This is expected as Gemini is your ruling zodiac sign. With Pluto in the 3rd house, you have a knack for communication and speak with conviction, so people tend to stop to hear what you have to say. Take some time to prepare your remarks if you can, so that you can answer any questions or concerns that may arise. A little time to work on your delivery can do wonders for your presentation and keep you on track. You have a tendency to go off on tangents, whether provoked or unprovoked, and this is the easiest way to lose someone’s attention. Stay focused on the task at hand and you’ll get better results. Make sure you have the full picture before presenting it to someone else. You’ll be doing yourself and the rest of your audience a huge favor. And if you want to reach spiritual enlightenment, you have to learn to process all kinds of information in such a way that brings you to a higher mental and emotional state. It’s well worth the effort. The only thing you have to be careful if you have Pluto in the third house is teaching a subject that you know very little about. Sometimes you have trouble concentrating on all the finer points of a topic, because your mind is so hyperactive and is always going a mile a minute. You have to learn to focus if you want to spread complete knowledge. It’s this concern that may make you pause when talking about certain subjects, for you do have some self-awareness of your tendency to zone out. Because of this, you may censor what you say or think about your words carefully before you speak. This is fine, as long as you already have the attention of your audience. But if you’re trying to instill confidence in your abilities then this will not go over as well. 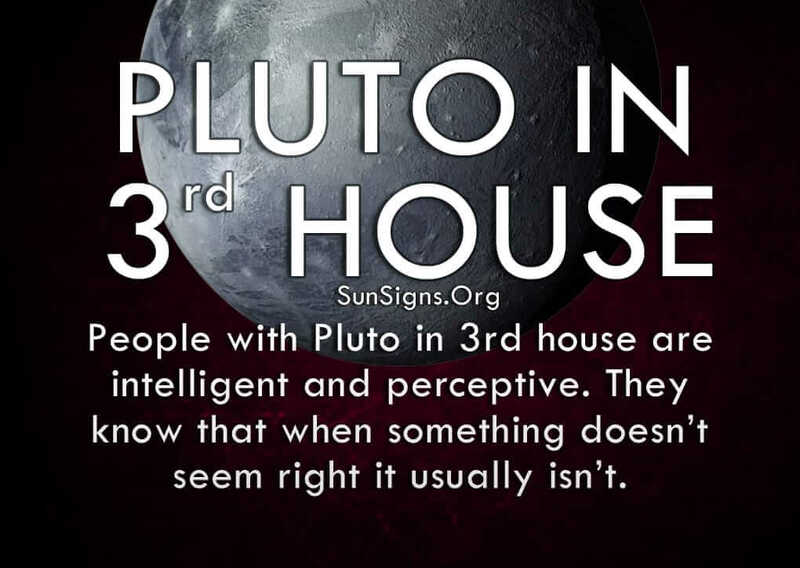 Another thing to be wary of is the tendency of people with Pluto in 3rd house to learn through observation. That’s fine as long as you have and understand the context of what you’re seeing. But since you have trouble with details, you might not get the entire picture and miss out on something important. Trust in teachers and those who have the experience to be called experts. While you may get bored listening to a lecture, that is sometimes the best way to get all the information. You can’t rely on your eyes and ears alone, no matter how much you believe you are learning in a certain environment. Don’t dismiss someone’s knowledge simply because you don’t like the way they present it. This will only cheat yourself and those you wish to educate. Are You Obsessive About Power?